The need for technicians to return to installation sites (truck rolls) to replace or rerun damaged coaxial cable, is just one example of how poor product performance can result in an inconvenience for customers and an increased operational expense for providers. In this blog post, we explore the importance of innovative design and robust quality testing for coaxial cable. Coaxial cable is used by cable operators, internet providers and telephone companies around the world to convey data, video and voice communications. Its creation dates as far back as the late 19th century when it was first patented in the UK, with its first commercial use in the U.S. being recorded in 1941 by AT&T. Today, it is estimated to be installed in more than 90% of U.S. households, currently serving more than 194 million Americans. Coaxial cables are comprised of a variety of parts, each of which is designed to protect and transmit electrical signals as accurately and as efficiently as possible. In its simplest form, coaxial cable is designed to carry its voltage on an internal copper core wire, which is surrounded by layers of shielding to prevent signal leakage. A dielectric insulator acts as a buffer, with an outer layer forming a metallic shield to keep radio transmissions and electrical impulses out. A flexible plastic or rubber outer jacket creates a final protective layer. 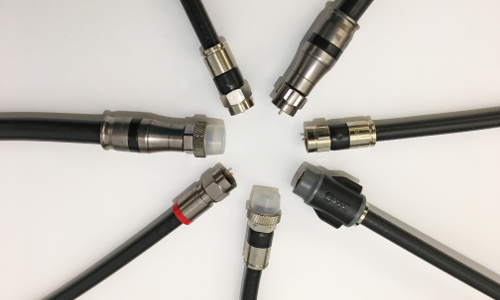 More recent coaxial cable technologies offer a range of new innovative design features to provide even greater levels of performance and durability. Some of these innovations include Perfect Guard and Perfect Braid. Perfect Guard™ – An innovative design to prevent corrosion in the network in a manner seamless to the tech/installation, and eliminates messy tacky alternatives used for corrosion inhibition. Perfect Braid™ – A unique design with a greater number of picks per inch, which delivers superior shielding effectiveness to other tri-shield cables. This also ensures the highest level of protection from signal interference and associated quality of service issues. Quality coaxial cable should offer superior electrical performance and be robust enough to stand up to the varying stresses of environmental exposure, handling and flexing. If used outdoors or underground, the cable’s flexible outer jacket needs to be able to withstand extreme exposure to the elements whether due to direct burial, moisture, corrosion, the effects of oxidation or UV light. Environmental aging tests, temperature cycling, pull strength tests and red dye testing are just some of the stringent methods that can be used to assess the quality and durability of coaxial under extreme conditions. Cable stress, due to flexing, can also cause micro-cracking, which can degrade performance and lead to unacceptable levels of ingress (outside signal interference) or egress (the passage of electromagnetic fields through the shield of the cable). Specialist flex testing stations, which induce controlled flexing and measure shielding effectiveness at predetermined intervals, are another invaluable tool for quality testing. When it comes to selecting quality products, it’s important to choose ones where the manufacturer selects components with higher-than-industry spec and takes care in testing their products. With better quality comes a reduction in truck rolls, which saves both time and money for the service provider.